"... [a] lucid presentation of Mipham Rinpoche's thought... Quite impressive." "... a thorough and clear study... a great source of understanding and inspiration..."
"Lama Mipham was one of the most extraordinary thinkers and meditators of the Tibetan Buddhist tradition. 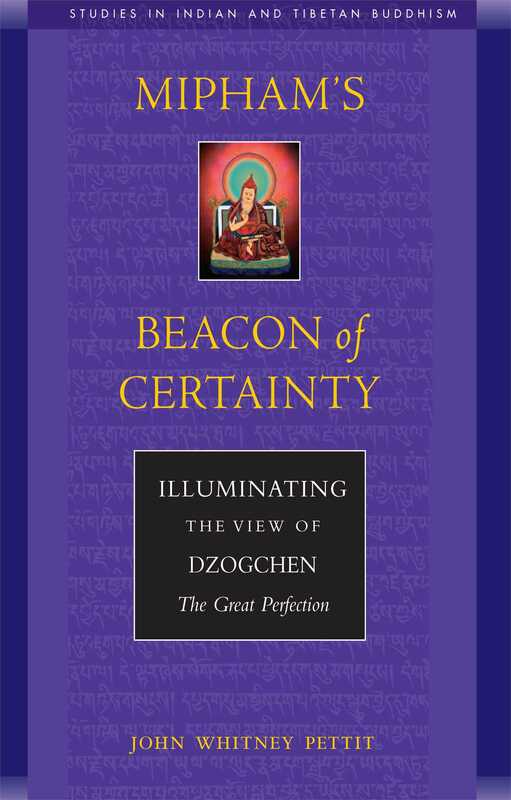 In his Beacon of Certainty he illuminates some essential points of Madhyamika philosophy according to the view of the Great Perfection (Dzogchen). John Pettit's translation and in-depth presentation is a major contribution to the field of combining Madhyamika and Dzogchen studies, that remains largely unexplored." "With this outstanding study and translation of Mipham's Beacon of Certainty John Whitney Pettit makes an especially valuable contribution to our knowledge of Buddhist philosophical thought in Tibet. Despite the abundance of recent work on the scholasticism of the dominant Gelukpa order, the philosophical traditions of the other Tibetan Buddhist schools remain largely unknown. Mipham was one of Tibet's great interpreters of the Indian Buddhist legacy, whose writings have become the primary texts studied in colleges of the ancient Nyingmapa order, to which he belonged, and are widely read by Tibetan scholars adhering to the other monastic orders as well. The remarkable text translated here is traditionally renowned as one of his foremost essays on Madhyamaka thought, one that is intimately related to the perspective of the Great Perfection teachings of contemplation. Dr. Pettit's perceptive exploration of this work will be much appreciated by all serious readers in Buddhist Studies and the Philosophy of Religion." "Lama Mipham Rinpoche was a great Nyingma scholar of the 19th century, who wrote a prodigious number of works on all subjects, as well as brilliant commentaries on both sutra and tantra. His work translated here by John Whitney Pettit as Beacon of Certainty was particularly famous and one of his most beneficial for clearing away the doubts and confusions on the view, path, and meditation. It is my earnest hope that John Pettit's translation will bring great benefit to foreign students and scholars in the study of both philosophy and meditation practice. This is a valuable work indeed. I pray that all sentient beings receive benefit from this text and ultimately attain Enlightenment." "Mipham's philosophical languaging of Dzogchen in Beacon is widely regarded as a major treasure of the Tibetan tradition and John Pettit's masterful introduction and translation bring it to Western readers for the first time. This is a riveting and wonderful work, an exploration of the crucial background texts underlying Mipham's thinking, and engagingly exploring such central topics as the relationship of reasoning to direct meditative experience in Dzogchen. Both readable and informative, Pettit's work gives the reader a real education in some of the most compelling issues of Buddhism, especially their impact on Dzogchen."